Over the years, I've heard complaints from musicians that their pages on magnatune point to other artists with the "customers who bought this also bought" but that they're not seeing links from other musicians to them. This happens because of the algorithm I use to find the purchasing relationships. Simply, what I do is find all the buyers of one artist, collect a big list of everything those buyers have bought, and then find the top 10 things those buyers bought. Simple enough, and it has historically produced results that made sense. However, it's possible that an artist sells much less than another, so that they point to that other artists (their customers buy the other one) but that because they don't sell that much, they don't make it to the top 10 of the other artists. Hence the unfairness in the system: you pass sales to other artists but don't receive any in reverse, which only contributes to the lopsidedness where they sell much more than you. Another problem with my algorithm is that the artists who have been on Magnatune the longest get the majority of the "also bought" recommendations, since their sales are the greatest (since they've been selling for a longer time). I've decided to try tweaking the algorithm to see if I can alleviate these behaviors. I've now changed the "also bought" algorithm so that it looks only at the past 100 days of purchasing. That will fix the "earliest artists to magnatune get the most recommendations" problem, and also means that artists who sell well in a brief recent period (such as after their new album launch) have more of a chance of getting onto the recommendations. However, the downside is that I'm looking at a lot less data, so the recommendations will be less accurate. Below is a chart of old vs new (before the 100-day tweak, and after) for a few related artists. You can see that the music genre hopping is more severe, but some more recent artists (such as Laurel Zucker) get featured in the new one and not in the older one, and some more obscure artists (ie Falik) show up. One other idea I've had is making an m3u playlist of "also bought" titles, so that you can listen to a few hours of music that people also liked who liked this artist. Does this seem like a *really* useful feature, or just nice to have? 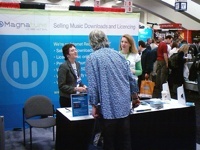 Teresa (who handles all our licensing calls) gave me feedback yesterday that she gets a lot of requests to license music for audio productions, such as instructional audio CDs (ie, meditation) or books-on-tape, and she asked me to add a new type of music license, specifically for audio projects. I also took the opportunity to clean up the license type choices, moving the most common ones to the top, and ditching the old alphabetical organization, which wasn't that helpful. I took the video/cdrom project type as my template, since the use is similar, and similar questions are asked. Most significantly, I lowered the budget choices for this down to $100 (CDROM starts at $10k) and added a foreground/background differentiator. The least expensive license (a $100 project) starts at $7, which means anyone should be able to afford it, though I default to "under $1000" which seems more likely for most audio projects. And on the top end, most licenses are a few hundred dollars, which is very competitive with canned royalty free music libraries (which are inferior music, and in the same price range). 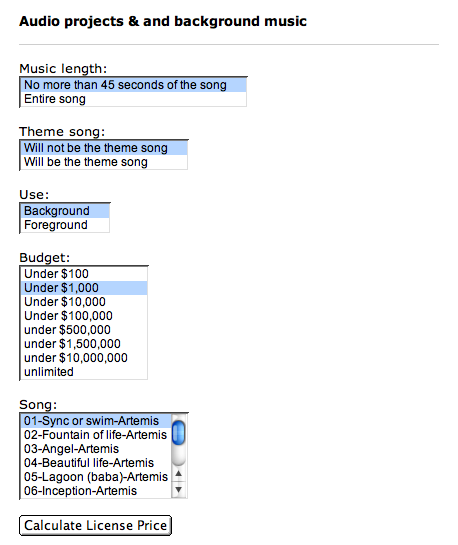 as usual, after the user fills this out, they're given a price, and after a few more details a contract and a "pay now" button. The Yahoo MediaShare Browser has integrated Magnatune's entire catalog into its browser. As their page describes it: "This plugin lets you surf the web for music. Look for tracks using Yahoo! Audio Search from within YME, or listen to some of the most recently posted stuff on the net. Check out what's popular or access the Webjay playlist community and Magnatune. It's a great way to be exposed to new music online!" in each genre, you can now listen to music and make playlists. You can rank the songs you like for later revisiting. All the music in the browser are our creative-commons licensed 128k mp3s, which sound nice, and also have Shannon's "you just heard..." message at the end. All in all, this is a great way to listen to Magnatune's catalog, build playlists and organize your favorites. It's also nice because people who use this player to find music from other sources will now be exposed to Magnatune. Shannon and Teresa worked out booth at MacWorld yersterday. Teresa reported to me that it's a madhouse at the conference, a hugely packaged show. Newsweek magazine evidently stopped by and took notes. We also had our neighbor and Magnatune mascot Bob helping out, handing out Magnatune postcards at the show entrance. What was most exciting were the massive number of people who already knew and loved us and were terribly excited to meet up and see that we were doing well. I'm working the show the whole day today, with Shannon and Teresa getting 1/2 days. It's exhausting work, but I absolutely love working a good trade show, as there's so much energy. Congrats to Lucas Gonze & Webjay for the announcement that Yahoo is buying Webjay and Lucas is moving over to their music group in California. Magnatune was the first big advertiser on webjay, and for about a year, every page at webjay had this great ad that Lucas coded. The ad asked you to listen to a random magnatune song (each page refresh changed the recommendation) and if you liked it, one-click add it to your webjay playlist. That's not the usual banner ad, since it didn't take people away from webjay, and really all it was doing was asking people to listen to our music. It was definitely successful, as lots of people added Magnatune music to their webjay playlists and magnatune, to this day, gets plenty of hits from webjay listeners. As webjay grew in popularity, Lucas very nicely told me he could get advertisers who paid more for that slot, and I was happy for him! I talk about webjay every opportunity I get, because I think grass-roots playlists, filtering and other community-based ways that music is discovered, are our most likely weapons-to-succeed against command-and-control big-money style marketing by the major labels. And Lucas runs one of the best of them. The fact that Yahoo is going to give this approach (shared community playlists) a try, means more visibility for Magnatune and other free-to-listen approaches to the music biz. As Lucas writes on the "music lovers union": Take it this way, because you should: there is huge economic value to open media. It's fringe now, but it's going to be central, and there are going to be a lot more deals like this. Is Magnatune a Record Label? 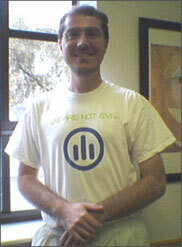 On the Magnatune tribe at http://magnatune.tribe.net Falik asked the question "is Magnatune a record label?". Well, a few months ago, Teresa and I had put together a list of everything we did, so that we'd have an answer to the perennial question "so what do you actually do for musicians?" so I used the re-occurrence of that question as an excuse to post this document we wrote. I'd be really curious to hear what people thing of this document -- does this make us a "record label"? Or some kind of "new Internet music thing?" 1) our compilation albums sell surprisingly well. When I put the compilation together, I'd like to split all the money from sales among the musicians on the compilation. However, when I have a "star DJ", I'd like them to get a cut as well - in DJ Cary's case, giving her 20% of sales for putting together the compilation, and 80% distributed to the musicians. 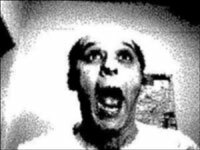 When there are 15 artists on a compilation I made, each artist gets 1/15th of the sale price of a Magnatune compilation. 2) Victor Stone has 3 albums on Magnatune that are remixes of other artists. I'd like the sampled artists to get 50% of the sale proceeds, as "remix source fees". When other remix albums occur, I'd like be ready to account for them fairly. 3) CDBABY is now paying us for sales of our music on iTunes and other services, and I want to both pay musicians for that, and also show them exactly what's selling where. So here's what's new for musicians on the "Musician's Dashboard" at Magnatune (this is something all musicians have instant online access to). In the "current balance" page, which is also what's emailed to them when it's time to pay, are two new lines, for "music in compilations or remixes" and for "sales at other music stores", the detail to which is available in the music license titled "CM2222#####" which they can view from the "music licensing detail" page. these are not huge amounts of money, but it's definitely the fair thing to do, and provides a small incentive for both remixers (they can make some money) and remixees (they can get paid for their source track contribution). Plus, it's all transparent and clear, so everyone hopefully feels comfortable with it. I am really looking forward to Ashwan's album being finished. He's on the Lisa D remix album, and when he visited me in London he dropped off an early version of his album that was incredible. 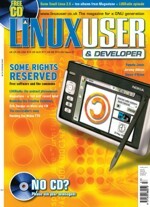 Linux User Magazine, in the UK, has an extensive interview of me, and the issue just came out, done by the fabulous Jon Masters (who I showed the Exploratorium to when he visited 2 weeks ago). On the CD of the magazine, readers will find 128k mp3 from 10 rock albums, as well as a nice web interface. The mp3s and web interface are those from the now-defunct TunePlug project, which I think is a good reuse of that effort. Unfortunately, I'm in Berkeley for another month, so I can't see the magazine article. If anyone feels like scanning the article and emailing it to john at magnatune - dot - com, I'd be forever grateful. 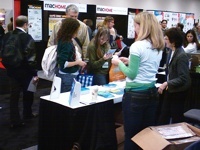 Volunteers for Macworld Needed ! You'll get a "we are not evil" tshirt out of it (see picture on right), and you can probably snag a lunch with me, Teresa or Shannon. So... if you're going to Macworld next week and you don't mind giving up an hour of your time, please email Teresa or call her at 510-289-3781 to let us know when's good for you. 2 years ago, we did this, got a bunch of people to hand out these cards and the response was *incredible* ! This year, we're handing out cards, and we're also exhibiting inside Macworld itself.